An absorbing biography of the beloved poet, philosopher, artist, and author of The Prophet. Waterfield has previously published an anthology of Gibran’s work, The Voice of Kahlil Gibran, and sets out here to correct the hagiographic portrait of Gibran (1883—1931) often painted by his followers. True, Waterfield asserts, Gibran was a genius, but he was also a complex man haunted by insecurities. Waterfield’s task is arduous in part because Gibran left a legacy of romanticized pasts for himself; at various times he claimed that he had been raised in a palace, had published romantic ballads in Syria and Egypt before emigrating at the age of 12, and had met the kaiser as a child. The reality was more a typical Ellis Island hardscrabble story, with Gibran, his mother, and his siblings escaping the poverty and patriarchy of their Lebanese background by coming to America. America was almost as cruel: Gibran’s mother and two of his three siblings died of terminal illnesses within a year of one another. Gibran sought refuge from his family’s hardships by drawing the portraits of the elite in Boston society, gradually playing upon their Oriental romanticism to be accepted (and financially supported) by them. 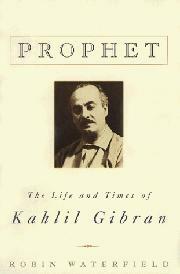 After a classical Arabic college education back in Beirut, Gibran returned to America to make a name for himself in art and literature. He studied art in Paris, courtesy of an older benefactress to whom he was once engaged, then sampled the bohemian life of Greenwich Village. Waterfield ventures further than any of Gibran’s previous chroniclers by including the details of the artist’s often callous sexual dalliances and his alcoholism, which caused his early death from cirrhosis. Waterfield’s agenda here is not merely to expose the artist’s feet of clay, but to show him as a man, as capable of narcissism as spiritual depth, as gifted at ruthlessly using others as at charming them. The result is critical but well researched and cogently argued.